The KREAS Project and the Department of Anglophone Literatures and Cultures are pleased to invite you to a workshop “Frankenstein: Emancipatory Narrative and the Role of the Reader”. 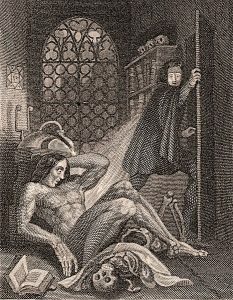 The 200th anniversary of the publication of Mary Shelley’s landmark novel Frankenstein has provided an opportunity for scholars to reconsider its significance in light of emergent critical perspectives. This workshop brings together four unique outlooks on Shelley’s defiance of literary convention and her emphasis on the emancipatory power of storytelling. By examining the novel’s portrayal of communication and listening and by highlighting Shelley’s innovations in structure and style, participating scholars demonstrate the continuing relevance of Frankenstein’s Romantic presentation of the power of narrative. Cassandra Falke (University of Tromsø, Norway): The Reader’s Regress: Frankenstein´s Reader as Judge or Confidant? By staging repeated scenes of storytelling, Frankenstein emphasizes how listening can empower or deny another’s humanity. Drawing on Emmanuel Lévinas and Kelly Oliver, this presentation explores the novel’s emphasis on being heard as a central part of being human. Frankenstein treats literary convention as malleable, and also emphasizes the role of the reader, who will have to consider both Victor’s reliability and her own metafictional complicity in the creation of the creature and its eventual estrangement. Frankenstein therefore represents a significant early example of how an “unnatural narratology” is deployed and manipulated to explore the boundaries of storytelling. This presentation will establish the stakes of the novel’s mimetic resistance: how do we reconcile the co-existence of what we perceive as “natural” narrative with what we perceive to be “unnatural”? Where do these prejudices originate, and how can they be manipulated or exploited? Self-describing at 26 as an ‘aged person’, Mary Shelley was late before she was ever early. Briefly examining the grounds for Shelley’s late tendencies, this paper argues that Frankenstein offers a prescient exploration of late style: it is, in effect, a novel by a reader attempting to hold her own against the anxieties of influence. Against the prevailing interpretation of lateness, which reads its impact as an exhaustion of possibilities, this paper examines its creative potential. Frankenstein will be demonstrated to establish a frame through which Shelley productively emancipates herself from her predecessors by situating its narration in a tense space between a shattered past and a disappointing future through a range of gestures, chief amongst them the exploitation of anachronism. Although the historical context of Frankenstein is characterized by the rise of the interest in organic theories of life, both in its individual and social or political forms, the word “organic” does not at all occur in the novel. This may appear strange, given the importance of organicism for the philosophy of William Godwin, the comeback of organicism in Coleridge’s Statesman’s Manual of 1816, and the influential lectures on the principle of life by William Lawrence delivered in the same year. The paper will argue that instead of the oppositions (or dialectical antitheses) between mechanic/inorganic and organic, the novel focuses on the failure of communication between humanity and artificial intelligence which consist in the Romantic misunderstanding of the principles of communication clarified in Norbert Wiener’s critique of Henri Bergson’s Vitalism. Unsurprisingly, liminality is crucial to all aspects of Mary Shelley’s novel, and largely defines its multiplicity of contexts and legacies. The moment of transgression, as Foucault suggests, involves the play of crossing and re-crossing the line, ceaselessly recasting but also reinstating the limit in the process. This paper explores the ways in which Frankenstein’s experimentation with and performance of liminality deals with ‘the horizon of the uncrossable’.